For the past six years, colleagues and customers in Red Wing, Minnesota, have participated in United Way’s “Backpack for the Weekend” program, which supports children in low-income households by raising supplies for peanut-butter-and-jelly (PB&J) sandwiches. Associated Bank has a long-standing commitment to the United Way. Colleagues embody that commitment and the Associated Bank brand by actively supporting the United Way agencies in their local communities. This year, colleagues were eager to continue supporting this program, as well as the children and families it benefits. Most of the children who benefit from this program are either on the free or reduced-cost lunch programs at their schools, and may not receive the nutrition to sustain them over the weekends when they’re away from important school lunches. The collection of PB&J supplies, as well as other donations received by United Way throughout the year, will help feed these children and their families on weekends. 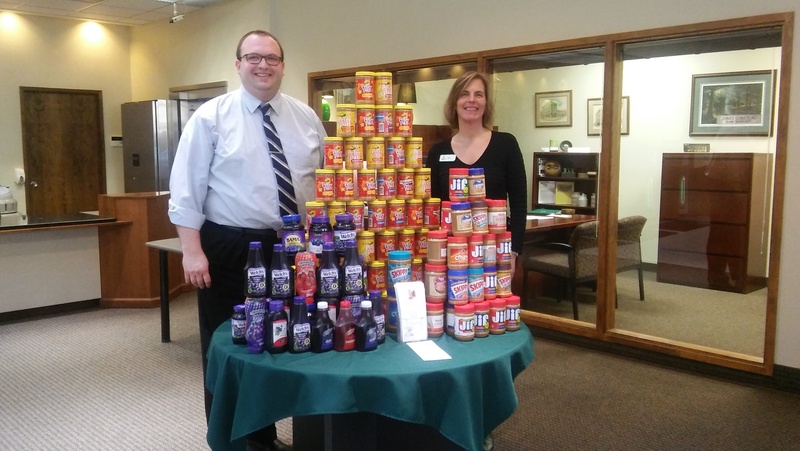 Photo caption: Jonas Gonstead and Jean Renschen of Associated Bank posed with the collected peanut butter and jelly for the United Way.